We are blessed and fortunate to own 8 automotive, finance & insurance related companies and 2 Ministry Non-Profit organizations and business is BETTER than it’s ever been! That’s why we have MANY GROWING CAREER OPPORTUNITIES available right now. The following openings are all FULL TIME permanent positions (No Summer Help positions available currently). All of the following positions are aggressive payplan, full time positions. All offer the opportunity to grow and advance in our organization. We are Subaru of Wichita (formerly Suzuki of Wichita – America’s largest Suzuki automotive retailer). The Number One Suzuki Dealership in the USA (now looking to do the same with Subaru and our Super Car Guys Brand) has more customers than we can handle and we need your help! 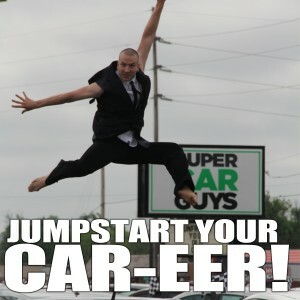 We are growing and business is running out of our ears (we are selling 350+ new and used cars a month). Inside the dealership we have multiple departments and opportunities: sales, finance, insurance, service, parts, and accounting. We currently employ approximately 130 individuals and are growing. “The Golden Rule” — Do unto others as you would have them do unto you. “Hire Nice People.” – Scott Pitman, Operating Partner and Chief Evangelist of Ride Auto Group (Subaru of Wichita & Super Car Guys). We are a golden rule dealership. We provide hope, empathy, honesty and integrity. We’re looking for like-minded people to join our crusade as we continue to make a difference in the lives of our co-workers, customers and community. We are looking for people who are passionate about helping each other. People who are creative, honest, unique, and helpful. People who think that their morning coffee shouldn’t be the most exciting thing that happens to them today. We don’t believe in boredom and we don’t have a country club membership (or environment). Safe, family environment (If you have a spouse, they will appreciate this). Does this sound like something you want to learn more about? Our environment is critical and will be guarded. YOU MUST BE A LIKEABLE TEAM PLAYER. No bullies. No whiners. No drama. No gossip. Duh, we have a killer benefit package (Health, Dental, 401k, etc.). Paid Training. Opportunities to advance. Recognition programs. Champions in our organization rise to the top and are promoted into leadership position where there is no income ceiling (this changed my life). We run a very fast paced, high energy, fun environment. We LOVE PEOPLE. We are servant leaders. If this is you, then we need to talk. [NOTE]: We literally receive thousands of emails a week so I want to tell you how yours will get opened faster which could help you get an interview before these spots are filed. When you email us, simply put the word RESUME in the Subject Line. Nothing else. SECOND, In your introductory email, tell us which opportunity(ies) you are interested in. Also tell us “Why” you want to join our team and why you think you are the best person for the opportunity(ies). Ability to pass a comprehensive criminal background check (No DUI’s, No Felony convictions). EXTRA CREDIT, For bonus points, submit a short video to introduce yourself. Tell us who you are, why you should have and interview ASAP and why you are the best candidate for the opportunity you’re interested in. We’re not looking for production quality; a cell phone video is fine. Interviews will be scheduled ASAP because these opportunities are available now (Detail, Technicians, PDR, Window Tint, Car Wash, etc. RUSH to our Rock Road location at 1633 N. Rock Road and ask for Marc Lee or TJ Lee for an on the spot interview and tour). We sincerely appreciate your consideration in joining our team. If you’re not looking perhaps you have friends who are? So, share this with your friends? 0 comment(s) so far on We are HIRING…for Pretty Much EVERYTHING!